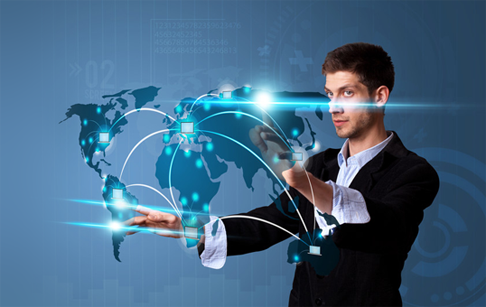 Managed Connectivity Services provide global network connectivity that helps you to communicate with your organizations and customers over a secure and reliable infrastructure. Our flexible portfolio allows for these services to be deployed either on an infrastructure owned by us, or in combination with a third-party infrastructure. You can choose a specific service in accordance with your needs or combine it with other Managed Connectivity Services. For further information please refer to our network coverage map or contact our representative via Live Chat. Through the Managed MPLS service, we provide you with a private IP network enhanced with high quality secure connectivity. This service delivers appropriate levels of latency, jitter, and packet loss to ensure a successful, concurrent handling of multiple types of traffic, voice and video in particular; it classifies and prioritizes traffic flows from end to end, enabling SLAs for multiple classes of service. We give you the ability to select a full mesh VPN option to pass traffic directly from site to site, and select the design configuration that appeals to your needs. Our Cisco-powered managed Metro Ethernet service provides you with high-speed, site-to-site connectivity that supports the delivery of voice, video, and other mission-critical applications. We deliver a variety of point-to-point and multipoint Ethernet services over Layer 1, Layer 2 and Layer 3 topologies with seamless integration; the service provides QoS functionality, including classification and prioritization techniques. Furthermore, it provides comprehensive SLAs, covering the overall performance of the service, as well as online access to detailed performance reports. Through our Managed Internet service, we provide you with secure Internet connectivity that is based on Cisco’s self-defending network architecture and built upon a highly reliable infrastructure. We deliver connectivity to you regardless of your location and access methods, and offer service-level agreements for network performance and service availability. Our service is backed by comprehensive SLAs, online access to real-time and historical service-performance reports,control access to the server, port utilization graph, the account balance and assures quality of service techniques, access control lists, and other industry leading practices. Our managed security IPSec VPN service provides you with secure site-to-site connectivity through encrypted data streams over a private or public network. It is based on RFC specifications and IPSec protocol – a framework of open standards, and delivers IPSec encryption and tunneling protocols, data confidentiality, data integrity, and data authentication over unprotected networks such as the Internet. This service offers DES, 3DES and AES encryption and can be provided together with managed Firewall. Our managed Router service provides you with remote router configuration, management and maintenance, ensuring 24/7 supervision of your routers in a Wide Area Network. We also offer regular backups of router configuration and software patch management. Our Cisco-powered managed IP Trunking service is a Session Initiation Protocol (SIP)-based trunk from us to an IP PBX or key system, delivering voice, multimedia and data traffic. We provide you with basic connectivity, emergency services, dial plan management and operation services, as well as realize complete local and long distance call connections. Our trunking service includes the IP termination service and features PBX with a gateway, an IAD or an IP PBX, and provides comprehensive SLAs covering the overall performance of the service and online access to detailed service-performance reports. Our managed Frame Relay/ATM service delivers Layer 2 site to site connectivity over a Frame Relay or ATM network, and we provide you with 24/7 management, monitoring and maintenance of your site routers in a Wide Area Network. The service also includes regular backup of router configuration and software patch management. Our managed Local Area Network service is designed to provide you with remote LAN switch configuration, management and maintenance, combined with software patch management. You benefit from reduction of costs for in-house IT department and a sophisticated professional management – all backed by our experience and extensive capabilities. Our solution design is accurately constructed to meet your specific requirements for all levels of service performance and can be complimented by other services such as IP Telephony. Service that enables to connect to members of Internet Exchanges through our network and benefit from cost, latency, and bandwidth. You can reach all major Internet Exchanges via a single port, over 1500 BGP sessions and traffic are exchanged with almost 1000 Tier2 and Tier1 ISPs that provide over 250,000 prefixes. List of IXs includes but not limited to: AMS-IX, DE-CIX, Equinix Exchange, HKIX, MSK-IX, LINX, SIX, TorIX, DTEL-IX, Digital Realty, TIE, Any2. High-speed, highly resilient broadband full BGP Internet table for ISPs, ASPs, CPs, telecoms and data center operators and corporates. Level3 partnership helps us to achieve ultimate connectivity both via HSIP and directly via peering partners, establishing sessions that bypass other autonomous systems. Extensive direct interconnections and well-established bilateral peering with numerous providers worldwide allow for load-balancing, route optimisation and excellent global and regional coverage. Available on 100FE, 1GE and 10GE ports at major data centers around the world or at customer premises with extended local loop. An international P2P leased line service that provides a dedicated, reliable and secure point to point connectivity solution between customers’ premises to locations worldwide. It supports all types of traffic (voice, data, video or any other latency and jitter sensitive multimedia applications), provides a wide range of bandwidths and offers scalability and flexibility to meet your present and future communications needs. A cost-effective connectivity solution that enables your organization to meet the demand of bandwidth-intensive applications with reliable, flexible, high bandwidth P2P configurations delivering high-capacity fiber connections between two sites. It enables you to connect your CPE using Ethernet interface with lower cost and allows to use any VLANs or Ethernet control protocol across the service without coordinating with IPTP. Quality of service EPL allows to use voice, data, video or any other multimedia.